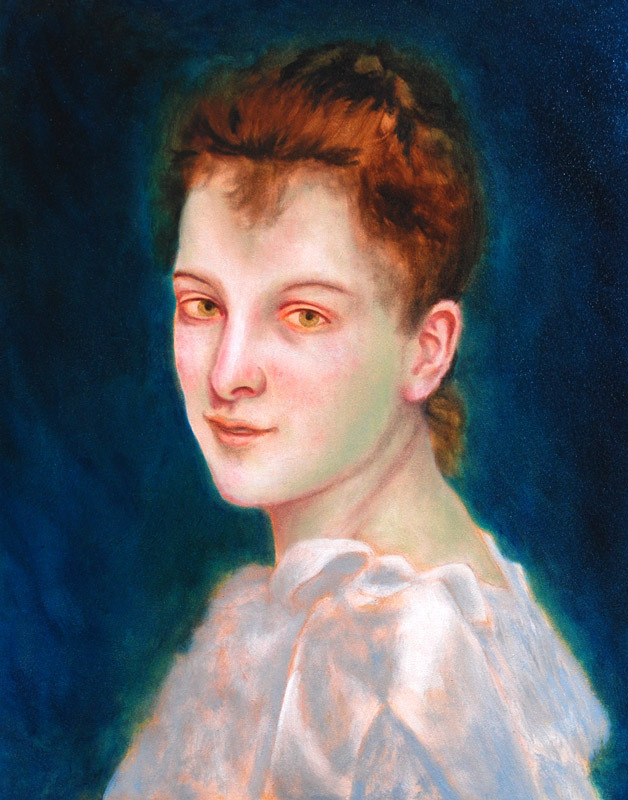 This will be a study of William Bouguereau's Portrait of Gabrielle Cot. Studies are a time-honored method for artists to learn techniques from master painters. Many of the "Old Master" techniques taught between 1500-1900 were virtually lost as the modernist movement took hold, and these techniques were regarded as "kitsch" and outdated, especially as photography took over the job of the portraitist at the turn of the century. So, the baby was thrown out with the bathwater, so to speak - these techniques were virtually erased from the art school textbooks. Bouguereau, possibly one of the finest portraitists ever, was not spared. While my techniques will not be exactly the same as Bouguereau, this will at least give an example of the steps, and the time, required to complete a painting such as this. Each of these stages had to dry for several days, so this painting ultimately took a month to complete. By showing the time-intense nature of this style of work, I hope to present an appreciation for the amount of skill and effort that the artists of the pre-1900 era spent in each of their paintings. Before any work is started, I typically tone the panel with a burnt umber wash. This provides a mid-tone base on which to start the painting, and I can add both lighter and darker values on top of that. Because the toned panels need to dry for a while before any work can be started, I usually tone several panels at a time so I have plenty pre-toned when I need them. This initial stage is basically a pre-underpainting underpainting stage. This is just a couple of hours work so far. I like to add white to all areas of the skin before shading, that way they are unified in color initially. Shading will come later. I just did a background wash of pthalo turquoise so that the background will have a kick to it when I add browns on top of that. When I paint, I think of the oil paint as one might view a stained glass window. A white underlayer provides an opaque base which will reflect light. Any translucent colors on top of that white base will pass through, hit the opaque white, and bounce back through the colored layers. While the background will be black, rather than this vivid blue, this will provide some life to the black, rather than just a dull matte color. Here's the next layer - remember, these are still just underlayers so some of the colors I've added won't be quite so intense, or will be covered, in further layers. This layer went quite fast, only about 2 hours work here, as all I'm doing is colorizing the previous white layer. The red skin tone is a wash of alizarin crimson, and the greenish cast is naples yellow+ultramarine - this is just to act as a toning mechanism to give the skin a translucent quality once further layers are added. A wash of french ultramarine+burnt umber has been added to the background also. Rather than black, I use a mix of French Ultramarine+Burnt Umber for my darks, as straight black paint can end up looking rather dull and lifeless. By mixing 2 contrasting colors to form a dark, the interplay of those colors adds life to the painting. This session was mainly spent adding another layer of skin and evening out the tones of the skin. My skin palette consists of naples yellow + white + a small amount of alizarin crimson. By mixing these colors in varying proportions, most pale skin colors can be obtained. My technique for creating smooth skin is "dab and scumble". I dab on the color paint with one brush, and then I take a dry brush, one that is usually pretty frayed already, and scumble the paint until the brush strokes are no longer visible. This technique must be done on a layer that is completely dry underneath, so that the scumbling won't pick up the previous layer's paint instead. Here's the next layer, there's still a lot of work and refinement that needs to be done yet. Whee, movin' right along here! Just have to do the hair yet and maybe a few face touchups, but the end is near. Finally got around to some highlights, so she's got some life now. Here's the final on this one.